You are currently browsing the archive for the Bangkok category. The Jim Thompson House in Bangkok. Thompson revived the Thai silk industry before mysteriously disappearing while on a trip to Malaysia. 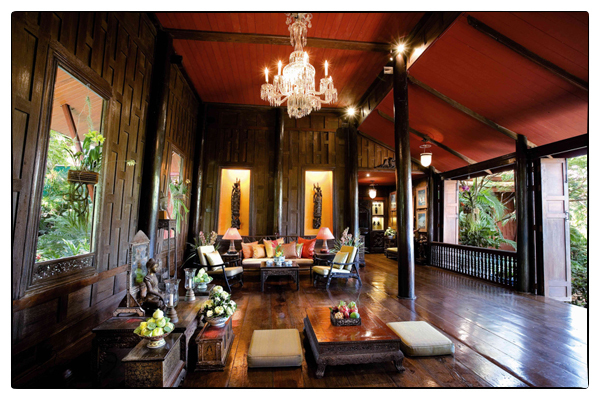 I stayed up late last night writing a long email to Jan about the Jim Thompson House in Bangkok. 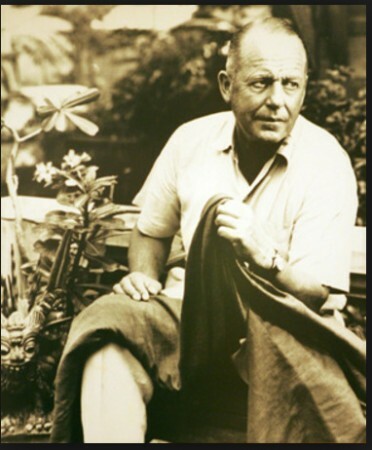 I patiently explained who Jim Thompson was—a WWII American spy who settled in Bangkok after the war and pretty much single-handedly resuscitated Thai silk weaving before mysteriously disappearing while on a walk in the Malaysian highlands in 1967. I really wanted her to get a sense of the aura of this guy and his house so my email was very detailed. Well, okay. I guess I was the only one in the world who had never heard of Jim Thompson. The mysterious Jim Thompson. To this day no one knows what happened to him. To be honest, his house (which has been turned in to a museum) is interesting, but what really fascinated me was the man himself: an American spy who leaves his wife in the states and moves to Bangkok where he becomes this mysterious figure who collects rare Asian art, and then just disappears on Easter Sunday, 1967. And it’s not like they didn’t look for him. At the time, the authorities launched what was called “the biggest hunt in Malaysian history,” more than 300 Malaysian soldiers and police combed the path he supposedly took for 11 days. Yet not a single trace of Thompson was ever found. If all that wasn’t mysterious enough, on August 30th of that year, his older sister was found bludgeoned to death in her Pennsylvania home. Nothing in the house was stolen, nothing disturbed; police found it all very puzzling. Why would anyone want to murder Mrs. Katherine Thompson Wood? The case was never solved; and to this day there are still no clues as to what happened to Jim Thompson. 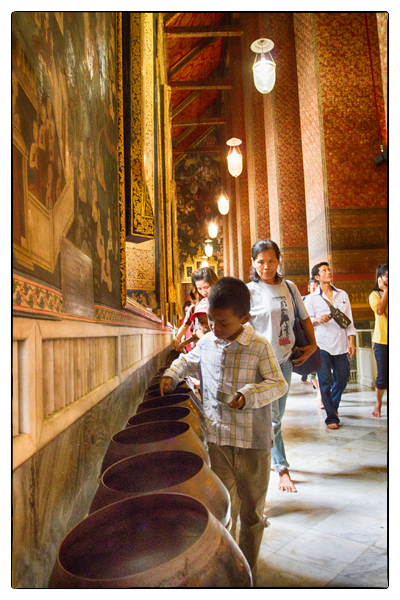 A child drops coins in to the alm pots at Wat Pho in Bangkok. Photo by David Lansing. As we were leaving the temple of the Reclining Buddha, Ketsara handed me a small tin can—like an empty tuna can—filled with Bhat coins. She pointed towards the back wall where dozens of metal pots were lined up. A little boy was going along, carefully dropping a coin into each pot. Others were doing the same. I asked her what parami was. So I walked along the cool, dark wall of the temple, thinking hard on the parami of generosity and the giving of myself. I thought very hard indeed. And when I’d reached the last pot, I still had a number of coins in my little tin. I asked Ketsara what I should do with them. I dropped in the coins. I made a wish. I didn’t tell Ketsara what it was. But I think from the look she gave me that she already knew. 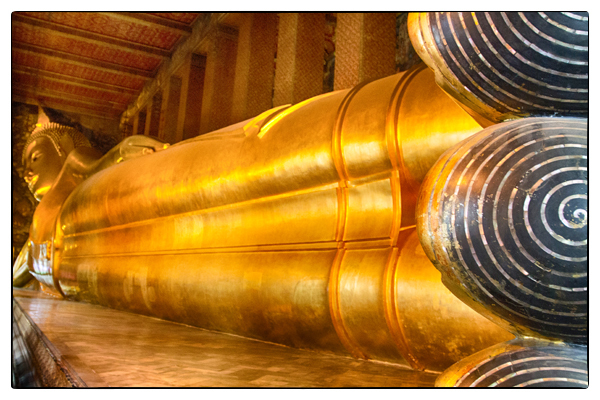 The 150-foot-long Reclining Buddha at Wat Pho in Bangkok. Photos by David Lansing. We are on our way to see the Reclining Buddha at Wat Pho. Steve and I have been bickering all morning. Like two young tiger cubs we snarl and claw at each other in play but sometimes one or the other of us gets a little too rambunctious and blood is drawn. Like a patient tiger mom, Ketsara has been silently watching us. “What day were you born?” she asks me. I ask her why she wants to know. She says for Thai Buddhists, there is a Buddha for every day of the week, depending on what day you were born. The head of the Reclining Buddha. Photo by David Lansing. This all sounds lovely but I feel there is more to it than this. “What are the negative things about the Friday Buddha?” I ask her. All of this talk has made Steve, who was born on a Tuesday, anxious to know who his Buddha is. 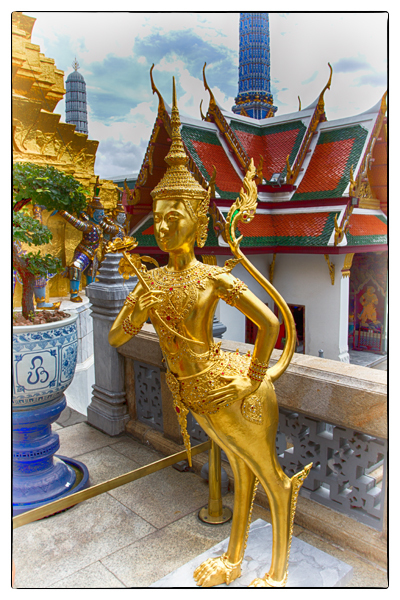 “You Reclining Buddha,” Ketsara tells Steve. The Reclining Buddha at Wat Pho is so large (over 150-feet long) that it is almost impossible to take a single image of it. Steve keeps sticking an elbow in my ribs as we walk around the Buddha. “This is my Buddha,” he says gleefully. It is impressive. But perhaps there is an equally impressive Thoughtful Buddha somewhere in Thailand. We will see. 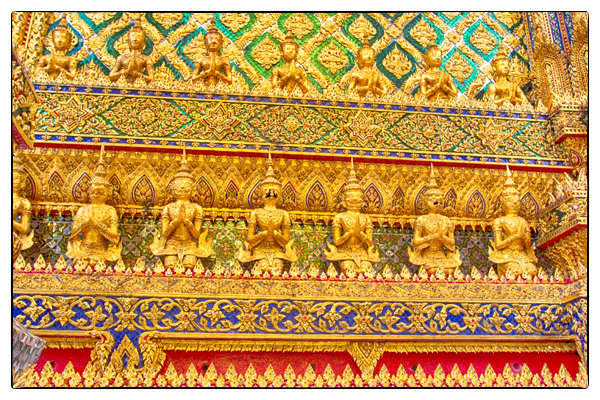 Stifling crowds wait for a glimpse of the Emerald Buddha at Wat Phra Kaeo. Photo by David Lansing. 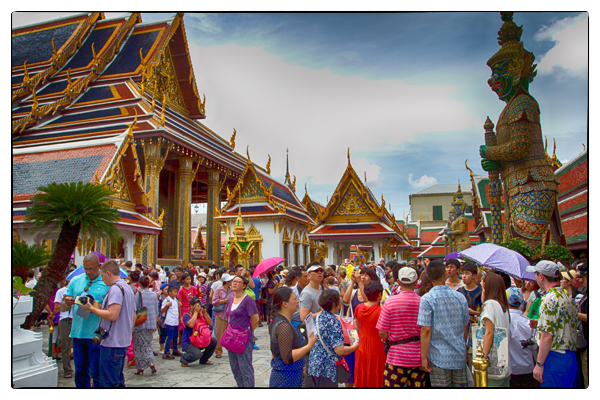 The crowds to see the Grand Palace and Wat Phra Kaeo, the final resting place for the sacred Emerald Buddha, perhaps the most important image in Thailand, are staggering. It’s like Disneyland on the busiest day in summer. And yet if you allow yourself to focus on the smallest wonders of the complex instead of the largest, you’ll find there’s serenity in the details that are ignored by most tourists—the fabulous Ramakien figures lining the chedi; the stunning 112 small garudas (mythical beasts that are half-man, half-bird) encircling the exterior of the bot of the Emerald Buddha; the gilded apsonsi images (another mythical creature, this time half-woman, half-lion), around the upper terrace of the Wat Phra Kaeo. Like everyone else, I took off my shoes and snaked inside the bot for a quick glimpse of the Emerald Buddha, being pushed and shoved from all side while chided by guards to keep moving. Except for the lacerating heat and blanket smell of a hundred sweating bodies in close quarters, it was a totally forgettable experience. A close-up view of the golden lion woman looking as if she were about to fly up into the sky, however, left me breathless. 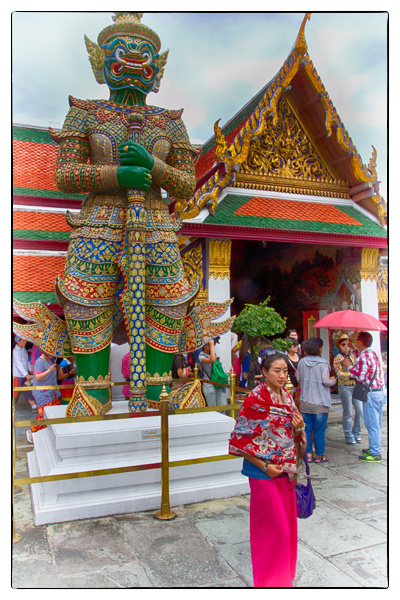 Ramakien figures guard the chedi at Wat Phra Kaeo. Photo by David Lansing. 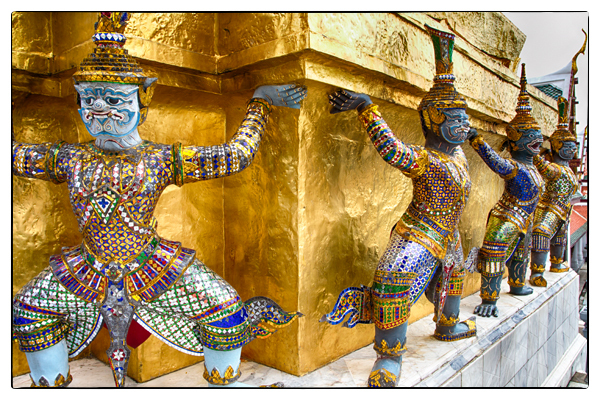 Angel guardians decorate the wall of the library of the Grand Palace. Photo by David Lansing. One of the Demon Guards protecting the chedi. Photo by David Lansing. Half-woman and half-lion, this gilded apsonsi looks as if she’s ready to take to the skies. Photo by David Lansing. 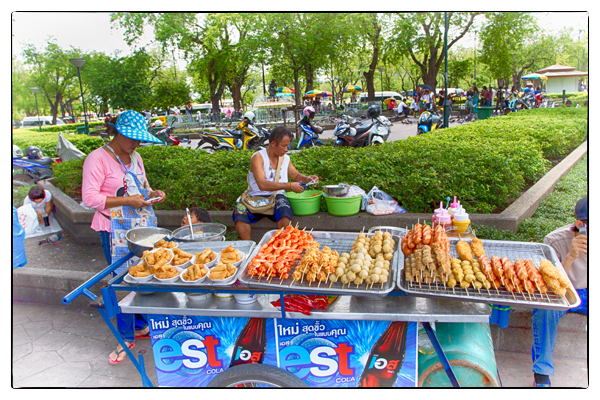 Food on a stick–it’s everywhere in Bangkok. Photo by David Lansing. Today’s phrase was Gin khao reu yang? I asked her what it meant. Thailand, which promotes itself as the “Kitchen of the World,” has the most amazing street food scene I’ve ever seen. You can’t walk more than a hundred feet in Bangkok without stumbling across a vendor selling some little snackable tidbit. The streets smell of garlic and chili and various cuts of pig or chicken grilling over charcoal. For around a buck you can get satays of duck sausages, fishballs, chicken hearts—whatever you desire. Most of this stuff is food-on-a-stick. You smell something fantastic—duck tongues and dried fish on skewers with a garnish of chili and coriander—plop down your 30 khat, grab your food, and off you go. An urban hunter-gatherer. And if, ten minutes later, you run in to an old friend, you greet him with a cheerful Did you eat yet? Even if, like you, he had a little something-on-a-stick just a few minutes ago, he’ll probably be more than happy to join you at the next sidewalk stall for a skewer of pickled hard boiled eggs or some curried cuttlefish. In Bangkok, it’s all good.